Hello, my name is Shannon Brown, and I am the 2018 OWUSS National Park Service Intern. I am excited to take you along with me as I travel for the next three months to various National Parks and assist with their ongoing archaeological, biological, and cultural programs. A little bit about myself…I was born and raised in a small suburb outside of Chicago, Illinois. I’m 22 years old, and I graduated with a B.S. in Marine Biology from the University of Oregon in spring 2017. After my summer with the National Park Service, I will be attending King Abdullah University of Science in Technology (KAUST) in Thuwal, Saudi Arabia to obtain a Master’s Degree in Marine Science. Within the marine field, I have a passion for marine invertebrates and marine conservation. I studied feather duster worms during my undergrad, and while interning in Bonaire, Dutch Caribbean last year, I participated in a long-term project on the island’s benthos and a project focusing on the lifecycle of a trematode parasite found in reef fish. This summer, I look forward to combining my love for the National Park Service (NPS), and my love for marine science as I learn more about the NPS diving and research programs. My journey began with an early morning wake-up on Sunday (5/13) and a short flight from Chicago to Denver. 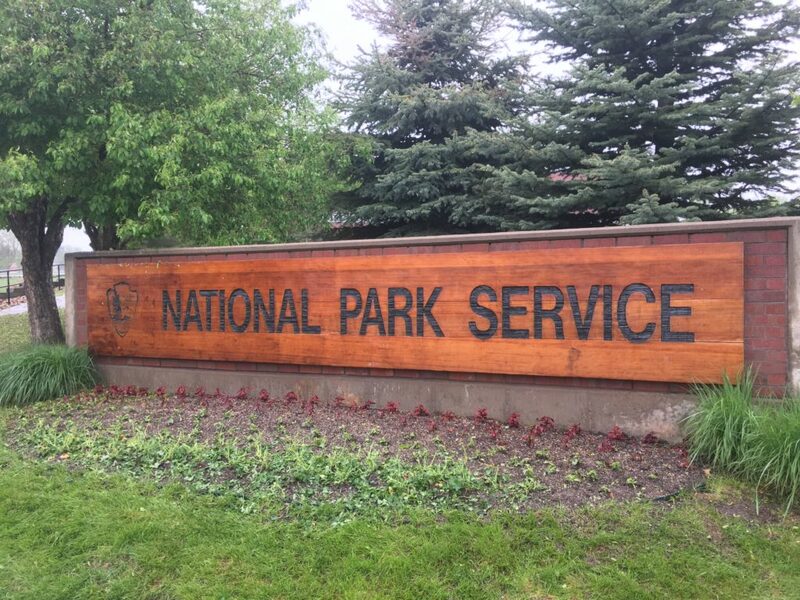 After getting my bearings and some caffeine, Bert Ho pulled up in a white suburban and graciously drove me to the National Park Service building in Lakewood, Colorado. Bert Ho is a survey archaeologist for the Submerged Resources Center (SRC). After being dropped off at the NPS offices, I spent the remainder of my Sunday settling into my Airbnb and learning how to park the massive white suburban. The next morning, I visited the SRC office and met the members of the team. Due to their intense schedules, this small group of archaeologists and two photographers are rarely all together. Getting the opportunity to sit in on a staff meeting was incredible. 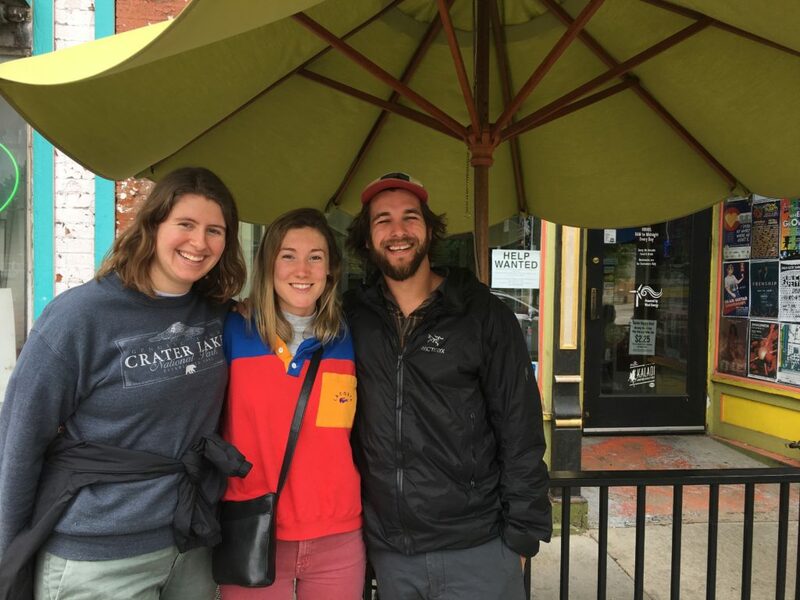 They took turns discussing ongoing projects that ranged from setting marker buoys at Isle Royale National Park to working with at-risk youth at Dry Tortugas National Park. In addition to meeting the team, I spent time discussing logistics with Brett Seymour, the Deputy Chief and A/V specialist. Additionally, with Jim Nimz, the SRC dive technician, Brett and I spent time determining what equipment I would require for my upcoming adventures. Tuesday morning began with medical testing required for my blue card certification. To dive for the National Park Service, divers must obtain a blue card which verifies their health, physical fitness, and diving knowledge. Jessica Keller, an archaeologist for the SRC, was kind of enough to drive me to the doctors in the early morning. After being poked and prodded, I headed to a local pool with Brett to complete the fitness portion of my blue card test. While I have faith in my swimming abilities, the swim test made me nervous due to Denver’s high altitude. Thankfully, I managed to swim the 75 feet underwater and 1,200 feet without swim aids within the required time frame. And I only lost one of my contacts in the process! 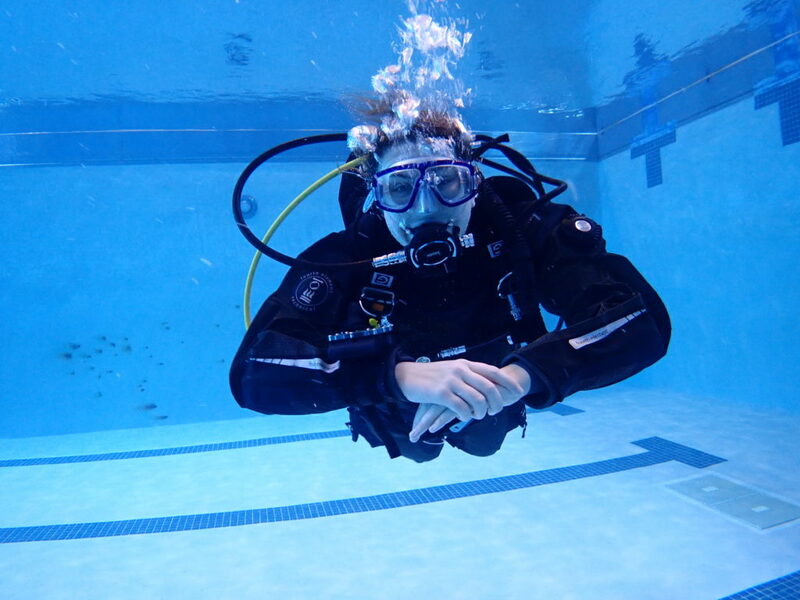 After finishing with a few dive skills, Brett and I headed back to the SRC were I completed the final portion of the blue card certification – the written test. Most of my travels this summer will be to warm water environments; however, at the beginning of my adventures, I will be diving at Channel Islands National Park. For this reason, on Wednesday morning, Brett and I completed my dry suit checkout dive. Jessica and Susanna Pershern, an A/V Specialist for the SRC, also accompanied us to the pool as they needed to test out equipment for an upcoming trip. Fully decked out in their dry suits and rebreathers, these two were mesmerizing as they gracefully hovered above the pool floor. After I learned how to properly dawn a dry suit, Brett helped me with my buoyancy and taught me how to properly dump (i.e. release excess air from the dry suit). Following the pool session and a casual lunch outside with Jessica, Susanna, and Matt (an Archaeologist for the SRC), I spent the remainder of the day watching videos from the NPS SRC Vimeo. You should definitely check them out! On Wednesday evening, Dave Conlin, the Chief of the SRC, invited me to Boulder to have dinner with him and Michele Tomillo, the national sales coordinator for Fourth Element. Fourth Element is the supplier of wetsuits, rash guards, and booties commonly worn by the SRC team. After a tasty dinner and lovely conversation, the 50 min drive back to my Airbnb was speedy and my bed was calling. Thursday morning was spent organizing gear. Since I am traveling/diving for 3 months straight, I wanted to ensure that nothing was left behind. Following a filling lunch with Michele and the entire SRC team, Brett and I collected our gear and headed to the Denver Aquarium. 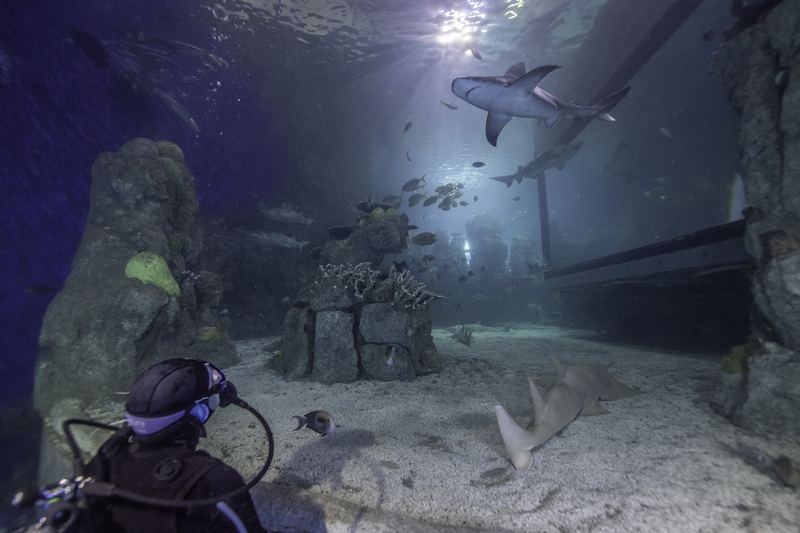 While there, we dove in the shark tank exhibit with the guidance of Wendy Murray – Dive Program Manager at the Downtown Denver Aquarium. 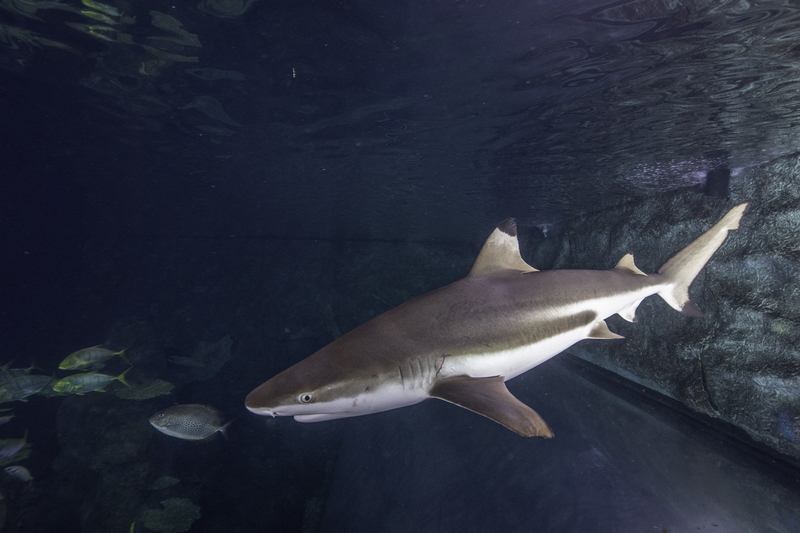 This exhibit has sand tiger sharks, blacktip reef sharks, sandbar sharks, zebra sharks, and sawfish. Not only did the exhibit give me a chance to test out my wetsuit and GoPro, but I got to observe these gorgeous, graceful creatures up close. While diving, we even found a few shark teeth scattered along the exhibit floor. 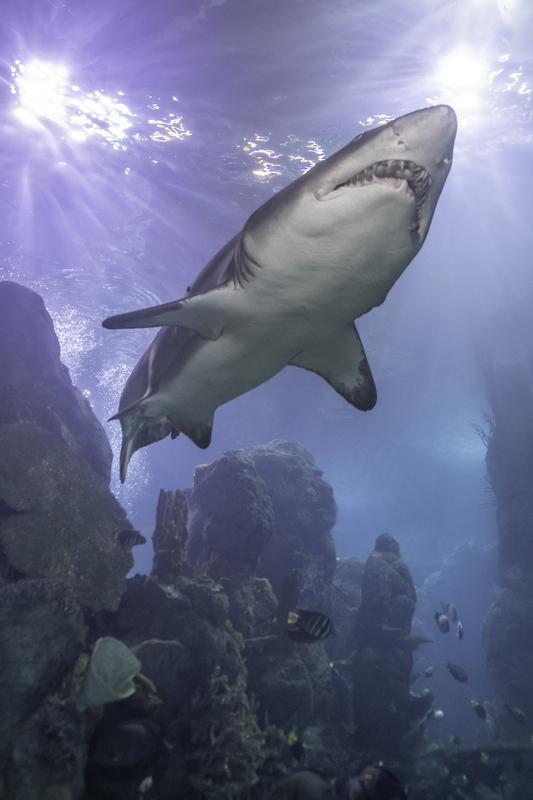 Shark’s teeth are organized in neat rows. 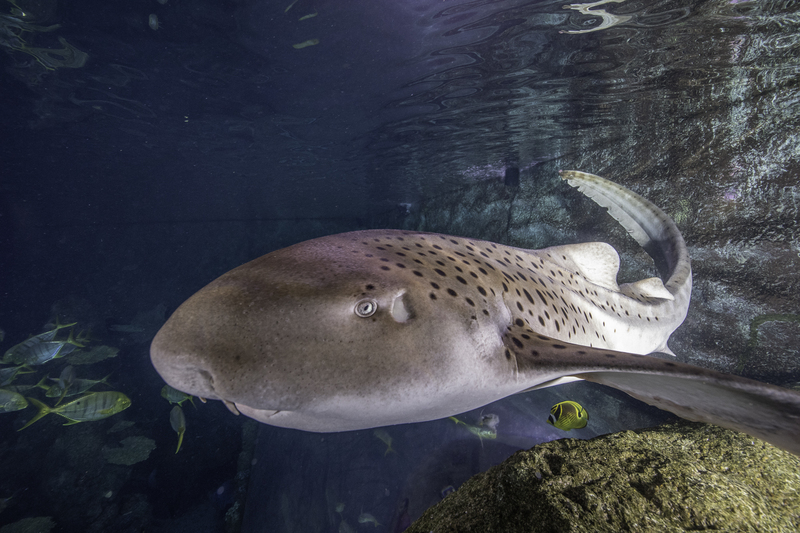 When sharks shed their teeth, which they do continuously, another tooth shifts into its place. On my last day in the office, I got to observe Brett and Susanna as they finished editing a video filmed in partnership with the WAVES Project at Lake Mead. I enjoyed learning about the project and also found it fascinating how much work goes into even the final stages of video editing for the SRC. My final full day in Denver was spent reorganizing since the dreary weather prevented much exploring. Upon leaving the SRC, my dive bag weighed 70+ lbs. 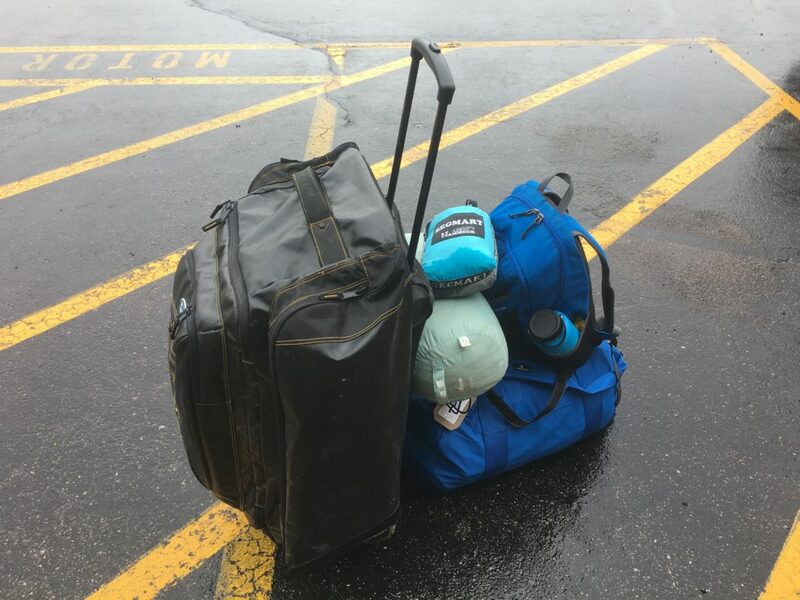 Luckily, after shipping several pounds of excess clothing home and reorganizing my small duffle, I was able to successfully reduce the bag to 50 lbs. Praise portable bag scales! All packed and ready to travel! In the early morning on Sunday, I parked the white suburban for the last time and headed to the Denver airport to officially start my NPS adventure. Before my flight, I was fortunate enough to grab breakfast with Leah, my previous coworker/roommate in Bonaire, and her boyfriend, Brandon. My first stop on this whirl-wind adventure is Channel Islands National Park. There, I will assist with the Kelp Forest Monitoring project by participating in a 5-day research cruise. Thanks again to the entire team at the SRC for being so welcoming during my time in Lakewood, Colorado. I enjoyed getting to know you all, and I appreciate the time you took to help prepare me for my internship. 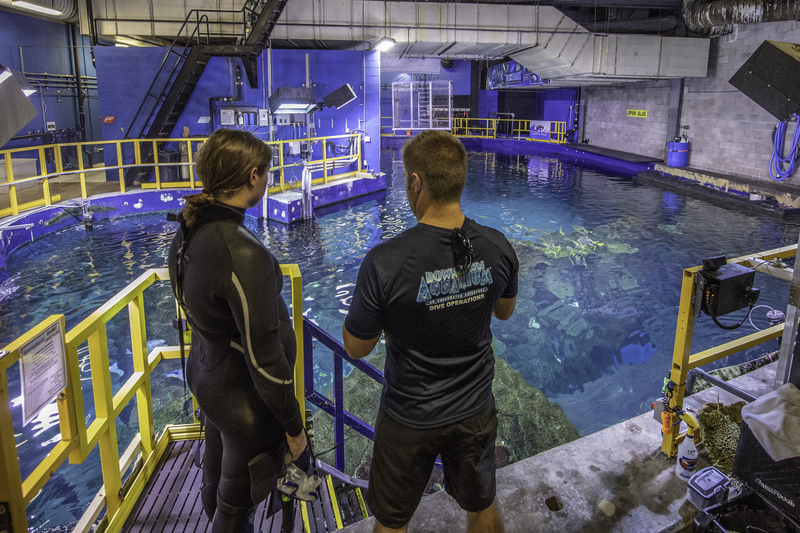 And thanks to Our World-Underwater Scholarship Society® for this spectacular opportunity. 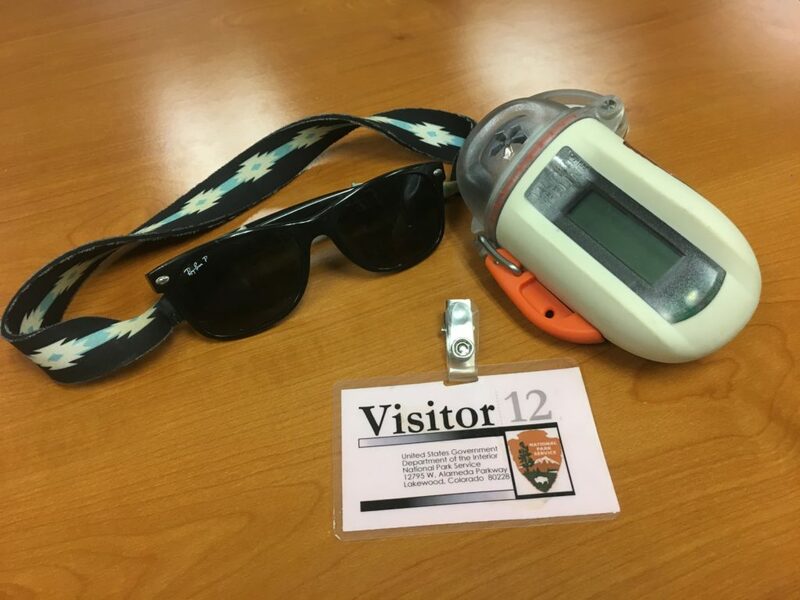 This entry was posted in 2018 National Park Service on June 2, 2018 by Shannon Brown. Welcome to the NPS Shannon. Sounds like you’ve already had some amazing travels and adventures for study and work! If we don’t meet at DRTO perhaps in Denver. Enjoy your internship and be safe!